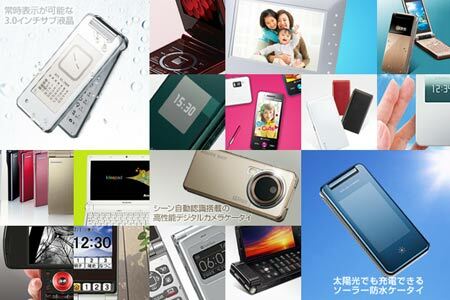 Tuesday May 19th saw a double-shot of new handset series announcements with flashy press conferences held by both DoCoMo and SoftBank Mobile (KDDI will announce next week). Leading the pack with six new units from Sharp, including the Solar Hybrid and unique Mirumo models, the energetic third place operator introduced 15 new handsets in total. The rest of their new line-up, due to hit the street over the next few months, come from NEC (3), Panasonic (2), Toshiba (1) and Samsung with the final trio including their OMNIA smart phone – targeted at girls! – and a branded Armani device. You can watch the presentation – 90mins run time in English – online video Here. To confuse the actual unit totals – promoting 19 new models – as they included a 4th Disney Mobile handset, a UMPC notebook from lenovo and two styles (plain and Hello Kitty of course) of mobile email enabled digital photo frames produced by Huawei. Technically, the Photo Vision models require a dedicated phone number (we can’t help but wonder if they will count as new subscriber additions?) and will be available for a flat-rate monthly fee of about $5 per month, hardware included. On the content and services side they announced a tie-up with MySpace for music, with a full line-up of content partners, ready to to roll in June. They also have a new video channel, via email offering, with a notable focus on sports as of course the company also owns the SoftBank Hawks pro ball team. Perhaps most interesting is the the Q&A session at the end of the presentation in respect to the companies activities on a global scale, Android vs. iPhone and their device strategy going forward.